Our headmaster droned on and on dispersing his school assembly address with tiny smirks that came so frequently they might have been tics, his spittle sometimes floating down on the first form kids in the front row. There were a lot of male teachers in my years of secondary schooling at Wangaratta High that had spittle problems! Suddenly our ears picked up an interesting sentence in his boring monologue. The Queen was coming to Benalla! A steady hum spread throughout the assembled group. We will get a day off school! Wow! 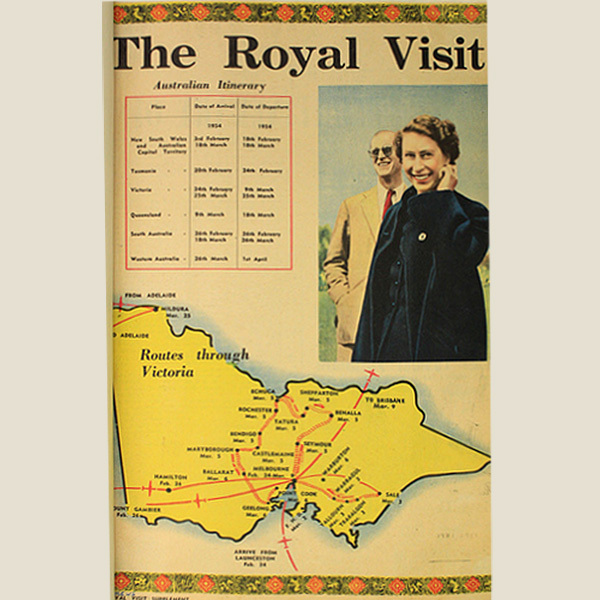 Queen Elizabeth 11 was coming to Australia, and coming to Benalla! It was hard to believe. Queen Elizabeth was our pretty monarch married to a handsome Greek (or was it German) prince. Philip was always pictured walking a few feet behind his wife, which always seem odd to us as young teens as our parents usually walked together. The excursion to see The Queen was not expensive, so we were all expected to go. Just the cost of a bus fare and we were to take a cut lunch. We had to wear the official uniform, or we would not be allowed on the bus. “No odd colours and hair-do’s imitating horses (ponytails)”, instructed the strict headmistress. Straw hats complete with our school badge pinned to a navy band was part of the girl’s summer uniform. The boys still wore caps with the school badge embroidered on the front. We counted the days until we assembled excitedly on the footpath in front of our school. It was March and a sunny autumn day. Leaves from the old elm trees were starting to fall and roll along the footpath in the gentle breeze. The early morning air was crisp, and the atmosphere on the bus was electric. The Queen was to be in Benalla at 10 am, so our journey commenced very early. We had to be at the Benalla Showgrounds in good time to march and settle in our allocated space. Then we waited, and waited, and waited! Our legs got tired standing so still, we finally had permission to sit. I did not own a watch, so I don't know how long we waited, but it seemed forever. The noise of the once quiet, now restless pupils permeated the warm air. Eventually, the sun became hot, and we became thirsty and hungry. We did not carry water bottles and were not allowed to eat until the Queen had passed. I think our Queen might have been a tad late. Suddenly a cheer rose up as the large black royal Rolls Royce turned onto the cycling track. “Here she comes”, cried out our teacher. We all began to wave our Australian flags, and as the royal car was completely open, we could get a quick view of our Queen. I think it took 12 seconds to pass. I did not get time to look at Prince Philip. My short glimpse revealed a very pretty young lady wearing a small hat and waving a white-gloved hand. Disappointed we ate our lunch on the grass of the oval and took turns in visiting the water taps and toilets. Picking up our spirits, we marched to our buses. We smelled of onion grass and dust combined with perspiration. We sang our war-cry all the way back to Wangaratta. Gosh, it was great having a day off school! Sadly tomorrow we would be back at our lessons again.